Freightliner Cascadia. Market leader Freightliner posted a 63.5% spike compared with a year earlier, selling 9,564 trucks. Class 8 U.S. retail sales kept climbing in August, reaching 23,913 vehicles, the highest point this year, WardsAuto.com reported. At the same time, truck dealers pointed to ongoing supply chain issues, and fleets found enough drivers to expand. “Holy cow, almost 24,000. That’s a good number,” Steve Tam, vice president at ACT Research, told Transport Topics. Sales were up 39.3% compared with 17,166 a year earlier. Tam suggested truck makers had cleared some of the red-tag trucks parked before they were completed because they were awaiting parts. Meanwhile, market leader Freightliner posted a 63.5% spike compared with a year earlier selling 9,564 trucks — good for a 40% market share. International Trucks sold 3,667, earning a 15.3% share, the next highest. Class 8 sales for the first eight months totaled 154,551, according to Ward’s. That was a 32.3% increase over the comparable period last year. ACT forecasts U.S. retail sales will climb to 253,500 in 2018, up 28.5% compared with 197,200 in 2017 — and 80% of those in any given period will be for replacement now, up from ACT’s previous estimate of 75%, Tam said. “We have purchased 10 trucks so far this year, and three within the last month,” said Riley Larson, general manager of JMS Transportation Co. Inc.
“Honestly, a significant amount of new hires has been from word of mouth,” in addition to ad campaigns, Larson said. The Cedar Rapids, Iowa-based company has 50 company trucks as well as about 85 owner-operators dedicated to its fleet operation, JMS Trucking Inc., that typically does shorthaul regional distribution of 250 to 300 miles with dry vans. “Two of the biggest things we need to have in place [on new trucks] are dependability, so it needs to have a good warranty because things happen, they’re trucks; also they have to be priced right,” he added. Truck dealers pointed to uneven supply chains. One dealer noted supply chain issues have improved, but Class 8 deliveries have been reduced by parts shortages. “You are seeing it in other industries, too, for instance in the airplane industry. Boeing is parking planes offline because they are still waiting on parts,” said Rick Reynolds, dealer principal at Peach State Truck Centers, which has 11 locations throughout Georgia and Alabama. The third quarter “has slowed just a bit from a robust first and second quarter, but it’s still a very active quarter” for sales, Reynolds said. The Norcross, Ga.-based dealership carries the Freightliner and Western Star brands. DTNA’s Western Star in August sold 497 trucks for a 2.1% share. “I think people are still hungry for trucks,” said William Thompson, who runs the project management office at TEC Equipment in Portland Ore. — the largest dealer group on the West Coast for Volvo Trucks North America and Mack Trucks. VTNA saw sales in August soar 53% to 2,315 for a 9.7% share. Mack Trucks sold 1,475 for a 6.2% share. 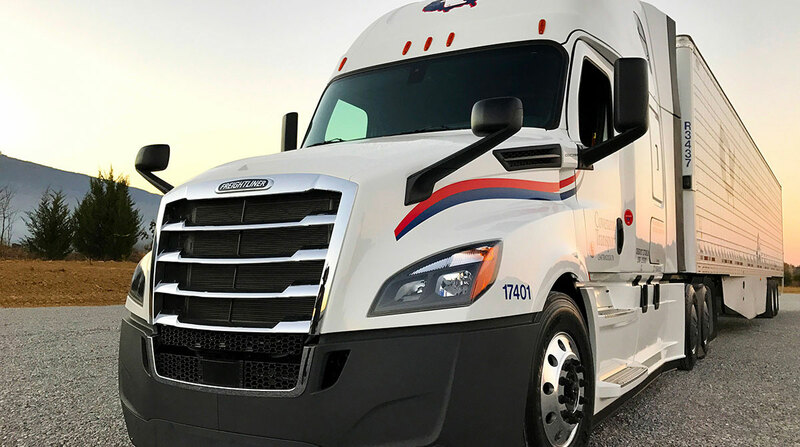 Another fleet executive said his company was growing, too, and better engine performance and in-cab driver amenities prompted him to switch to a different truck maker when he added new trucks. “Over the last two years we have just about doubled in size,” said Garrett Bowers, CEO of Bowers Trucking Inc. During 2018, Bowers has purchased five trucks to accommodate growth. “I rely on my current drivers to refer for us. If you can’t get the lowdown on a company from drivers who’ve been here a while, then who can you truly trust?” he said. The Ponca City, Okla.-based carrier is primarily a flatbed fleet that has some dry vans. It launched a new refrigerated division this year. The company has 60 trucks. Peterbilt Motors Co. posted a 12.4% share on sales of 2,966. Kenworth Truck Co. notched 3,429 sales, and a 14.3% share. Peterbilt and Kenworth are brands of Paccar Inc.